I’ve been happily messing with KSP for several years now, regularly returning to start a grand new campaign with a slew of interesting mods. For one reason or another (real life, .exe instability, mod quirks) I’ve tended to hit a wall shortly after going interplanetary in previous attempts, but with the (relatively) recent arrival of the 64-bit client on Windows and a more mature crop of mods I’m gearing up to try once again. I intend keep a diary of sorts here, in part to motivate myself and in part to act as a sort of tutorial to others who are interested in playing with similar setups but are unsure how to bolt all the pieces together and convince them to play nicely. I’ve chosen to start these reports a little way into the campaign, as there is already a wealth of material covering the first steps of a campaign. I have just unlocked the first KSPIE technologies, Nuclear Propulsion, Nuclear Power and Advanced Electrics. These nodes contain the earliest nuclear engines, reactors and beamed power parts respectively. Tortoise rover and Makellan satellite near Mun. Tortoise rover and Makellan satellite near Minmus. There are currently small ‘Tortoise’ rovers carrying basic science equipment on both the Mun and Minmus (BonVoyage is my new favourite toy) crawling around doing science. In addition, the ‘Makellan’ series of early SCANSat satellites remain in orbit around Kerbin and its moons to act as makeshift communication satellites until more permanent infrastructure is in place despite having served their original purpose of mapping the surface. Going into month 5 (I’m working with 30-day months), there are two main projects I’m planning to work on. First and foremost, deployment of some lightweight interplanetary probes powered by the recently developed CANDLE engine in time to catch transfer windows to the Urlum and (possibly) Neidon. 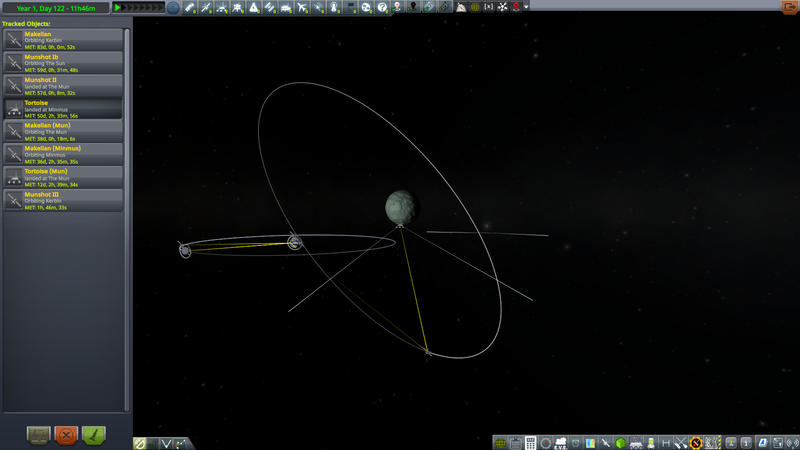 This might also require the deployment of a dedicated communications network around Kerbin to ensure continuous connection. RemoteTech's Root model (under which antennae can communicate at a range equal to the square root of the product of their individual ranges) means you don't need much of a network to get out to the moons provided you use the flight computer to make sure you don't miss your capture burns. 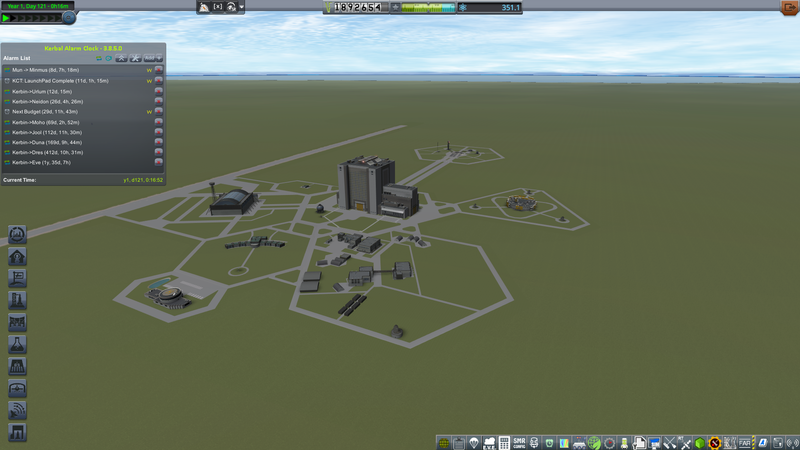 Due to the immense range of the ground station at KSC, probes can maintain a connection for about 50% of the time. I am going to have to put at least a simple network around Mun in order to explore the far side with the munar Tortoise rover though. 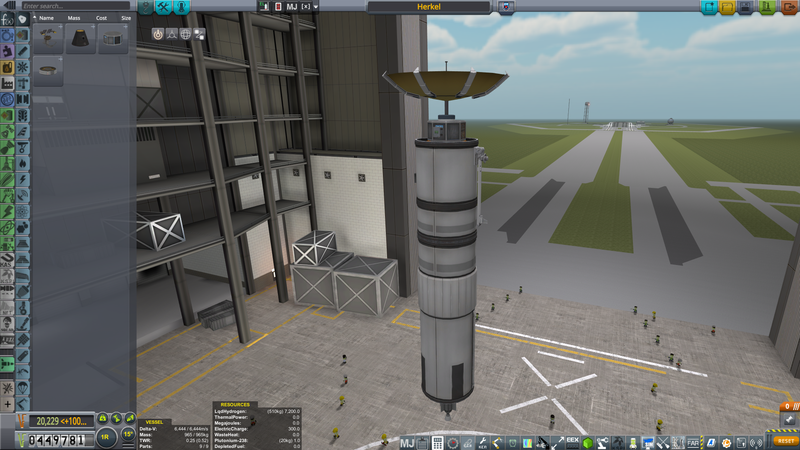 Secondly, and perhaps more interestingly in the long-term, development and deployment of a basic beamed power infrastructure around Kerbin, with the aim of using thermal receivers to launch lighter payloads to orbit more cheaply than currently possible. This is going to involve a fair amount of experimentation to find a sensible arrangement (I haven't messed with this area of KSPIE since it was reworked), but that's part of the fun, right? My CKAN list currently shows well over 100 mods installed, before counting my personal tweaks and a few older mods that remain compatible despite their protestations to the contrary, so I’ll just provide the highlights here and leave the full list in a spoiler below. Interstellar Extended by Freethinker et al. I’ve loved the idea of this mod ever since I got it way back when Fractal was still developing it, and I’m looking forwards to playing with the new toys that have been added in the mean time. This is the mod I think people might find most interesting when covered as a tutorial, since the existing documentation is either scant, obsolete or simply absent. Or more accurately a very slightly tweaked personal version that produces a Kerbin with a 12-hour day and a 540-day year. It makes orbiting a little more interesting and gives all those beefy advanced drives from KSPIE something worthwhile to do. This has just gotten more and more enticing over time, and the integration of Extraplanetary Launchpads and Ground Construction provides some interesting possibilities for a budding space program. I’ve recently switched over from TAC-LS after finding it doesn’t mesh particularly well with Kronometer and after learning USI-LS now has habitation timers. I’m a sucker for strategy games and this mod provides both a pleasant bit of medium- to long-term planning and reduces the necessity of grinding contracts for funds. I have it set to decay reputation each month and have Play Your Way (Galileo) set to provide reputation with gathered science. The intention is that as I clear out Kerbin and its moons, I’ll need to set up other revenue streams (munar/asteroid mining operations perhaps). 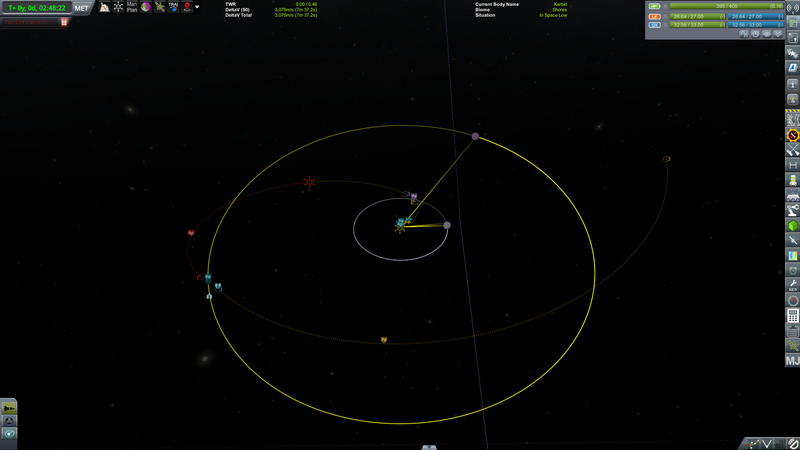 This mod actually makes a campaign feel like a grand undertaking as you watch your space program grow over time. The broad customisation options don’t hurt either. I like what this set of mods changes about the game generally, and have had an interesting time with the new custombarnkit settings in the recent version. RemoteTech 2 by neitsa et al. Mostly because I haven’t dived in to learn the ins and outs of CommNet, and from first impressions RemoteTech is more intuitive and I’m already used to it. I have it configured so extra omnidirectional antennae do increase range and am using the Root range model. In addition to the above mods, the main other factor altering gameplay is a tech tree plugin of my own design that massively increases the cost of the more advanced tech nodes and adjusts the science available on each planet. At time of writing, the final tier of KSPIE technologies cost 100,000 science each. The intention is to force me off Kerbin and to avoid unlocking the entire tech tree with a few missions to the Mun and Minmus. Accompanying this are a variety of tweaks to where parts appear on the tree so I don’t, for example, need to finish a Joolean tour before being able to unlock thermal rocket nozzles. Good luck! KSPI should be more interesting to play with in 6.4, where it can serve a real purpose. I find the stock system too small for it. Thanks! I think you're right, there's little need for the more advanced drives in stock. Beyond that though, having played 6.4x before, I can't seem to bring myself to go back: I seem to have just got comfortable with the larger arrangement. With the transfer window to Urlum bearing down on me, I decided that getting a long-range interplanetary probe ready was the most pressing concern. It took a little while to decide on the payload, but in the end I settled on a very lightweight craft with a thermometer, barometer and magnetometer. I toyed with a design that included some goo and materials bays, but the extra mass and the poor transmission efficiency resulted in abandoning it fairly quickly. 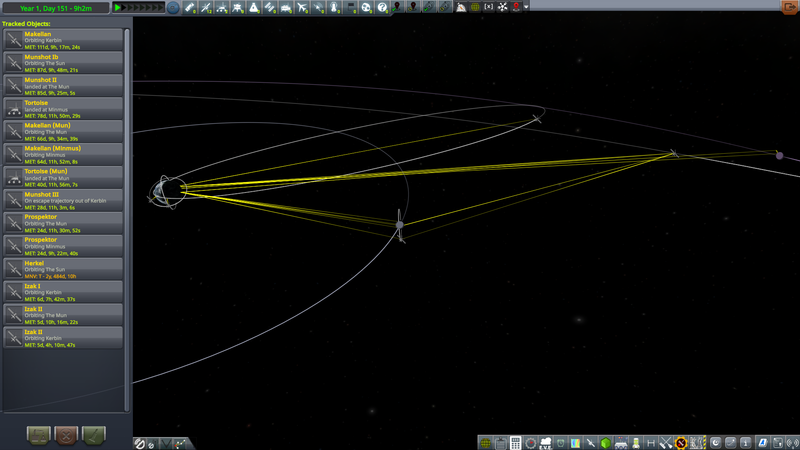 Along with the scientific equipment, I needed to include a long-range antenna. Since I didn’t have the science to grab the extreme-range GX-128, I opted for the Communotron 88-88, which should be able to comfortably reach the KSC antenna or the GX-128s that will likely end up on whatever communications satellite I’ll eventually settle on. See spoiler for launch rocket. This kind of craft is very well suited to using the CANDLE, which is essentially a RTG used to heat reaction mass rather than produce electricity (although KSPIE’s implementation produces a small amount of electricity). It provides not only a lightweight, high-specific impulse engine, but also a long-term power supply that crucially does not depend on sunlight that will be extremely weak at the outer reaches of the Kerbol system. At this stage I have the technology to fuel it with liquid fuel or hydrogen, and opted for the latter. Hydrogen is much lower density, resulting in a larger probe body, but the higher Isp it offers considerably reduces the mass of the probe, and the TWR remains almost the same as a result of the reduced fuel mass. I think it’s worth taking a moment to mention at the available upgrades for the CANDLE, since they come quite soon on the tech tree on the way to other useful techs. The first comes at Improved Nuclear Propulsion and improves the already impressive Isp by 20%, pushing it to a little over 1,000 s as well as increasing the thrust by 25%. The second upgrade, at High Efficiency Nuclear Propulsion, increases the thrust again, bringing it up to 4.4 kN, while leaving the Isp the same. For now, I’m leaving them both alone, as they have to compete with the Gravioli detector, which offers far greater science returns in a far shorter timeframe, making it hard to justify any other research for the time being. The Herkel probe is now in production, and should be ready for launch a few days before the middle of the transfer window. In other news, a new probe in the Munshot program, Munshot III, has been launched carrying the recently developed magnetometer to gather data from the moons and from interplanetary space. Its flight plan will take it around Mun, using a gravity assist to boost it up to an encounter with Minmus (after a small correction burn), which will provide another gravity assist to boost it into orbit around Kerbol. Also in production is another pair of satellites, named Prospektor, carrying the M700 survey scanner to examine the moons for resource desposits for eventual ISRU operations. Next in the pipeline is beamed power. This is a rather involved topic, so I’ll probably break it down into a post covering the theory, including a brief overview of the maths involved, followed by another detailing how I intend to set up the network based on that. Beamed Power Theory: We don’t need all these wires?!? This is probably going to be a little dry, but since I spent the time figuring it out I thought it'd be worth posting so other people don't have to. If anyone has any suggestions for accompanying pictures that would make things clearer I'm open to suggestions (bit under the weather at the moment or I'd take another pass and do it myself ). Preamble: Why do we even care about this? Before getting into the nitty-gritty of how beamed power works in KSPIE, it’s probably worth considering why it’s worth bothering with at all, compared to conventional chemical rockets. All other things being equal, in KSP we’d preferably use the most efficient engine (that is, the one with the highest Isp) all the time. However, engines differ in more ways than their Isp: they can be more or less massive, produce higher or lower thrust - which combined with a different mass can produce significantly different thrust-to weight ratios (TWRs), have different costs or form factors to name just a few possibilities. For a launch stage, the main requirement is that they have sufficient thrust to get themselves and the rest of the rocket off the pad, with other parameters being of secondary importance, leading to their relatively poor Isp and inflated costs. Nuclear engines, like the stock Nerv, or the thermal nozzles in KSPIE when connected to a reactor, can produce both a high Isp and thrust, but the early molten salt reactors are so massive that they can’t produce a useful TWR for use in a launch stage. Beamed power lets us do an end-run around this problem by transmitting the power from a large ground-based power station to a relatively much lighter launch vehicle by connecting a thermal nozzle to a thermal receiver. The thrust is only limited by how much power the receiver can handle, with a 1.25 m model clocking in at 500 MW. Exactly how much thrust this produces depends on propellant choice and ambient pressure, but for a high-altitude launch site (which we’re going to be using, see below) and hydrolox fuel (which provides double the normal thrust) it translates to a little over 270 kN of thrust - more than the Reliant or the Swivel engines often used in light launch stages, and a corresponding TWR higher than any stock engine - while having an Isp of 747 s, vastly superior to any chemical engine. These improvements massively reduce the ratio between launch vehicle mass and payload mass from the region of about 20:1 I’ve been managing so far to something more like 4:1, with all the associated reductions in cost and construction time that implies. Megajoules, Gyrotrons and Divergence: How Do They Work? Disclaimer: All of this is based on KSPIE’s ingame interface and perusing the code on the GitHub. I’m not especially familiar with C# though, so it may not be completely accurate. Any corrections/clarifications would be very welcome. In order to transmit any megajoules (MJ), we need to make some first. I’ll do a more detailed post on this later, but very briefly this involves a reactor, an electrical generator and (if you’re using a thermal generator, you will be to begin with) some radiators. The hotter the reactor core and the cooler the radiators, the closer the generator will operate to its maximum efficiency. To begin with, this process is likely to be your least efficient step in this entire process: before upgrades, the efficiency of a thermal generator is limited to 32%, and in practice it’s hard to even approach that (the relatively low temperature of the basic molten salt reactor doesn’t help here either). Once we have some MJ, we need to convert it into electromagnetic radiation that we can transmit. For this we need a beam generator and a transmitter, and fortunately there are some parts that double as both. We’ll consider the microwave transducer which – among other things – can generate and transmit beamed power in the form of microwaves. Generally speaking, microwave generators are very efficient: even the earliest models operate around 90% efficiency. Other beam generators like the diode laser array or free electron laser can produce other, shorter wavelengths of light, but at considerably lower efficiencies. We’ll ignore these options for now and concentrate on microwaves. Now that we have our microwave beam, we need a receiver where we want to use the energy. This can either be a thermal receiver like we’re using here or an electrical receiver that provides MJ directly (remember that converting thermal to electrical is very inefficient, so receiving thermally when you need lots of MJ is probably a bad idea). The efficiency of this transmission depends on a lot of factors, but the most dominant ones (at least when dealing with microwave transmissions through atmosphere for a launching rocket) are the distance between the two vessels, the receiver’s orientation relative to the transmitter, and the altitude of the two vessels. In other words, the diameter of the beam increases linearly with distance: the shorter the wavelength and the larger the aperture of the transmitter, the slower the divergence. Relative orientation is a little more complex, but it varies with the scalar product of the unit vector along the axis between the transmitter and receiver and a unit vector along a specific axis of the receiver part, depending on the part. That is, it varies with the cosine of the angle in question and is included by reducing the receiver’s effective diameter, reaching 50% at roughly 30 degrees. Where r is the distance between the receiver and transmitter, PT and PR are the pressure at the transmitter and receiver respectively, atmodepth is the depth of the local atmosphere and Aλ is the atmospheric absorption of a given wavelength, as given in KSPIE’s data files. The dominant term here is the exponent of r: reducing ambient pressure at the transmitter and receiver by a half can reduce atmospheric losses over a given distance by two orders of magnitude. With all the above in mind, the approach to constructing beamed power launch infrastructure is clearer: the K2 mountain range to the west of KSC is sufficiently high (15-20 km) as to all but eliminate atmospheric losses, allowing for the use of shorter wavelength microwave transmissions that would be seriously hindered at sea level, but at such an altitude simply extends the system’s effective range. 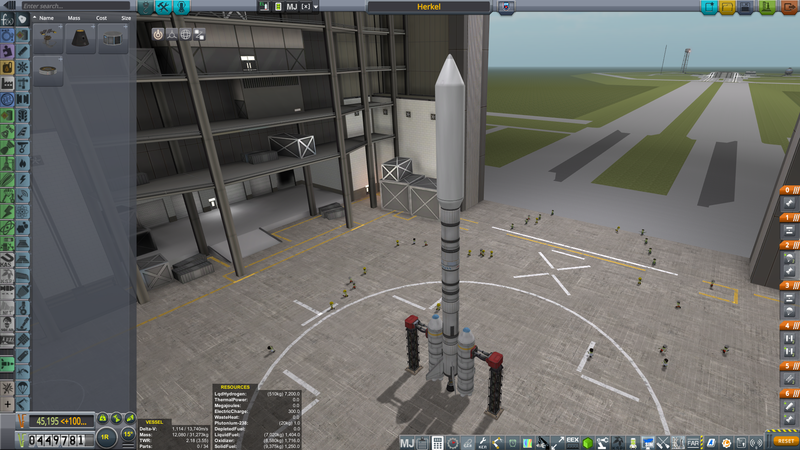 The first step will be setting up launch facilities in the region (looks like I’ll get some use out of Kerbal Konstructs), before developing and deploying a ground station that can provide the 500 MW of beamed power a 1.25 m thermal receiver can use and the thermally powered launch vehicles to make use of it. I haven't messed with KSPI in a long time, but when I did, I discovered that beamed power didn't work so well for launch vehicles. Back then, you used the stock 88-88 antenna for the receiver on the ship, and it had to be open to work. Thus, it either blew away or burned off as the lifter built up speed (this was pre-1.0 so I was using FAR and DRE). Is there a way around this problem now? All in all, in fact, I found beamed power to be of very limited use in a career game. It was no good for lifters and you couldn't use it in space until you'd built a huge network for, rather like a communications network, which you couldn't afford to do until the late game anyway. But OTOH, once you were out of the exploration phase and into the exploitation phase, was great. IOW, it was a tool for either sandbox or so late in a career game that it's basically become sandbox. 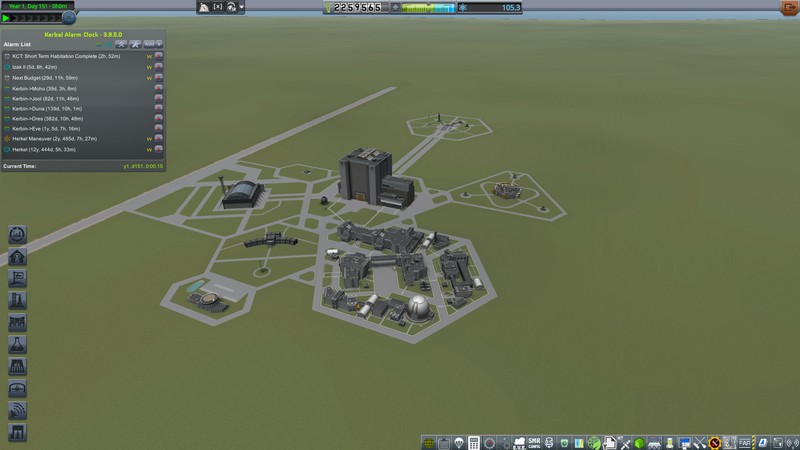 Then it was very useful for setting up huge colonies and even Eve SSTOs. I remember that version! Beamed power always seemed kinda wonky to me back then, and as a result I never really messed around with it much. There's since been a massive expansion in transmitters and receivers. For the launch vehicle I'm designing at the moment, I'm using an inline thermal receiver, which is effectively a black cylinder about the size of an FL-T200. It can receive any wavelength but converts it directly into thermal power, and then acts like a reactor, meaning you can place it at the bottom of a reactor next to a thermal nozzle. It doesn't have any issues with aerodynamic forces, although I've found I need to attach some extra radiators to my nozzle or throttle back during ascent to avoid the nozzle overheating. Also it receives optimally from the side, meaning you need to tweak your ascent profiles a little more than usual to make sure you can receive power all the way to orbit. In my case I'm fairly sure the reactor will be quite expensive to build, but will allow me to put (relatively) large payloads in orbit at a fraction of the cost I'd need to do it with normal means. 6.4X might be helping a bit here, as it produces mountains with relatively lower pressure at their summits, making low-tech networks more effective, as well as necessitating higher delta-v reserves and therefore higher fuel mass fractions, making beamed power overall more useful. One issue I have found while designing my baby network is that the earliest options for setting up a network are incredibly inefficient: due to the low core temperature of the molten salt reactor it's very difficult to achieve a reasonable beamed power output without at least a few upgrades. I've just run into a glut of science from my munar rovers and new gravioli probes, so I'll be able to grab quite a few that should make the network much more effective. I'm interested to see how the updated system works with more advanced tech, but I'm a fair way from that just yet. With the Herkel probe en route to Urlum, most of the remainder of month 5 was taken up with relatively straightforward scientific missions: the previously mentioned Prospektor satellites that have now finished gathering resource data from both Mun and Minmus, and a new design – Izak – designed to carry gravioli detectors into highly-inclined orbits around Kerbin and the moons in order to return a hefty amount of science. I’ve used some of it to improve the designs for my beamed power ground station, while the rest has gone to rounding out the (relatively) cheap tech nodes I’ve been neglecting thus far in the aerodynamics, ISRU and habitation branches. Near-Kerbin space is becoming gradually more lively. Izak II is currently about half-way towards completing its mission to provide all gravity data from space around Mun, while Izak III is currently en route to Minmus with a similar objective. The Tortoise rovers continue to crawl across the moons whenever they have daylight, with the Minmus rover having almost completed its travels around the smaller moon. 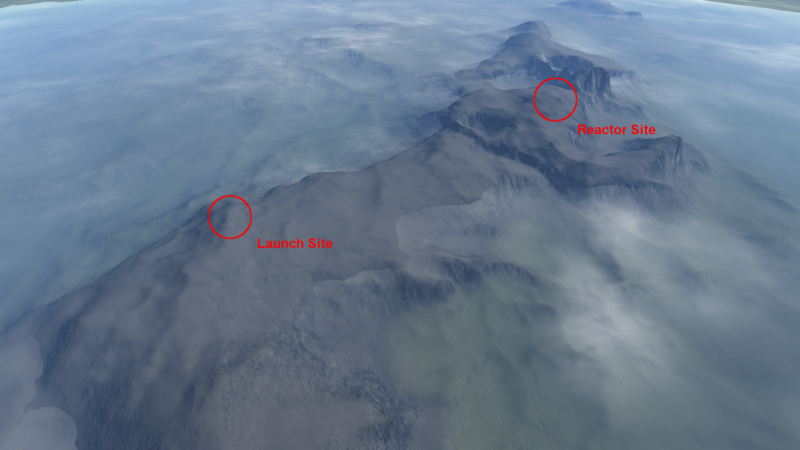 A considerable chuck of the monthly budget will be going towards setting up new launchsites in the K2 mountain range, as well as the reactor ground station for the beamed power launch system. 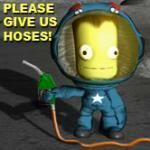 Once operational, my options for exploration should open up considerably, as payload fractions will increase markedly. The highest point I could find in the range is the central spire, but that seems pretty inaccessible to use as a launch site. The ridge to its south however, seems ideal: almost the same altitude and with much easier access. Deciding on the location of the actual launch site turned out to be a little trickier than I expected however, high altitude is good as described above in the post on beamed power theory, but I found I needed a good separation between it and the power station or I’d run low on power before completing orbital insertion. Since that will take most of the month to construct (even allocating most of the available KCT upgrades to it), the only other missions being planned for this month are a trio of high-altitude mapping satellites carrying the new SAR scanner and a couple of new munar rovers carrying new scientific instrumentation. While I could probably construct some kind of Saturn V equivalent to land a kerballed rover on Mun or Minmus, I’d rather wait for the beamed power system to bring launch costs down. It's been a few years and a few versions since I used KSPI, but I have fond memories of that career. I found lots of success by having ground-based power transmitters a few kilometers north and south of the launch pad, on the island runway, on the island to the NE of KSC, and on one of the larger islands across the sea to the east of KSC. When combined with the constellation of power relays I had in orbit, launches with thermal nozzle craft became practical and reliable, with at least one emitter or relay always at a good angle to a thermal receiver on the craft. Why'd you send something there so early? The more you muck around with anything from Jool inwards, which at this point you must for Science!, the less progress on its nearly decade-to-much longer trip anything going to the Outer Planets will make. And by the time you've got the Science! you need from the "inner planets" (which, with OPM, includes Jool), anything you've already sent towards the Outer Planets will be hopelessly obsolete, and probably get there AFTER new, high-tech stuff you can send in a couple years. I'm hoping to get to that point in the future, currently a bit short on funds to do everything I want to. Right now I'm playing with different ways to set up a network to cover low-Kerbin orbit, then looking at expanding out to Mun and Minmus. Mainly because I can honestly: I had most of the science I could do with a flyby unlocked already, and because launch windows to the outer planets are pretty infrequent. I am wondering if I'll be able to overtake it with some kind of baby torchship in the future (which would make for an entertaining mission in itself) although with the big increases I attached to the high-tech nodes I'm not totally sure. Mainly because I can honestly: I had most of the science I could do with a flyby unlocked already, and because launch windows to the outer planets are pretty infrequent. I dunno. Windows to OPM planets come at intervals of 1 year plus a few days. 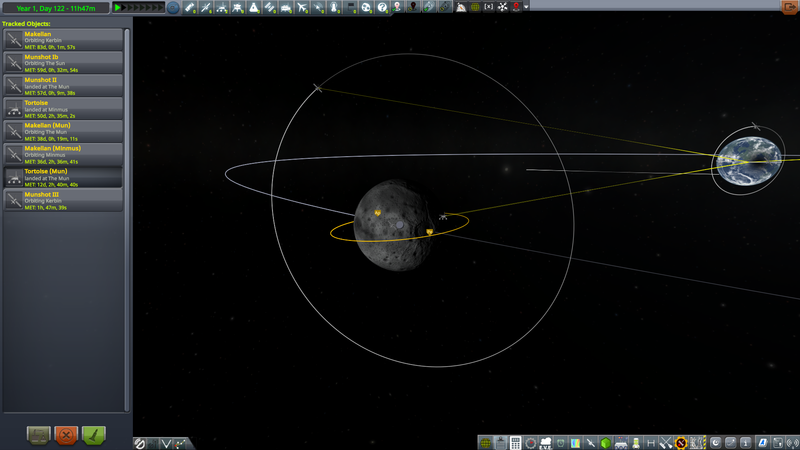 At timescales of 1 year, OPM planets don't move very much so it's all about Kerbin making a lap. Also, because OPM planets don't move very fast, their inclinations and eccentricities make only small, incremental dV differences from one window to the next---it takes many years before such effects add up to anything significant, if they ever do (really only matters for Plock). So don't sweat launching for OPM at the earliest opportunity. You'll get another chance every year. Leaving 3-5 years into the game makes no real difference to the trip itself but lets you have much higher tech, perhaps even with the tech tree complete. You really want to have the tech tree complete before you leave. First, you want the tech for the OPM trip itself. Second, the trips take so long that you'll have the tech tree finished before the OPM mission arrives, so you effectively get no Science! from out there anyway. Third if you still have to scrounge Science! closer in while your OPM misison is en route, your OPM mission won't make noticeable progress. The only way to ever see the Outer Planets is to warp ahead for years at a time while doing nothing else. 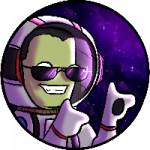 Y'know on some level, I'm sure I knew launch windows come up once a Kerbin year, it seems so obvious now that I think about it... I guess I was just stuck on thinking in month time-frames. There'll definitely be a mission to recover the original Herkel for kicks once I've got some shinier toys to do it. I guess I was just stuck on thinking in month time-frames. Yeah, OPM forces you to think in terms of decades. With the most efficient transfers, a trip to Sarnus and back is about 1 decade, Urlum is 2, Neidon is 4, and Plock can be up to 16 (worst case). So you obviously want engines with insane Isp so you can pack way more dV than you really need, allowing you to take faster, less-efficient routes. But even so, you're still talking multiple decades for anything beyond Urlum. When I last did OPM, my best vacuum engine was the Nuclear Lightbulb from Atomic Age (now in Spacetux Recycled Parts by @linuxgurugamer. While rather better in both thrust and Isp than the LV-N, using it resulted in the mission times noted above. There are more high-tech options in other mods. But regardless, given the huge travel times, you'll never get there if you're mucking about for very long at less than 100,000x warp, and even that's too little for most OPM missions. You need a mod that allows 1Mx warp or more. And all of this means, you can't be flying ships around on shorter missions, nor have bases and stations that require frequent micromanagement and crew rotations.